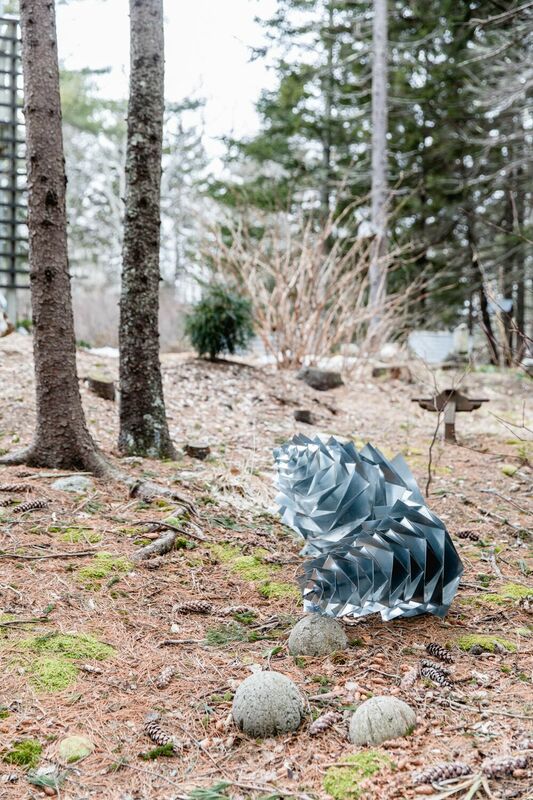 Dan Dowd is one of those mysteriously located, incredibly talented artists in Maine. Living in a small town on the coast with a little over 2,000 people, down a long dirt road that winds around until you see his orange painted stumps and metal-sided house on the hill, he has crafted a unique and fascinating space out of a dated seasonal home with views of the water. 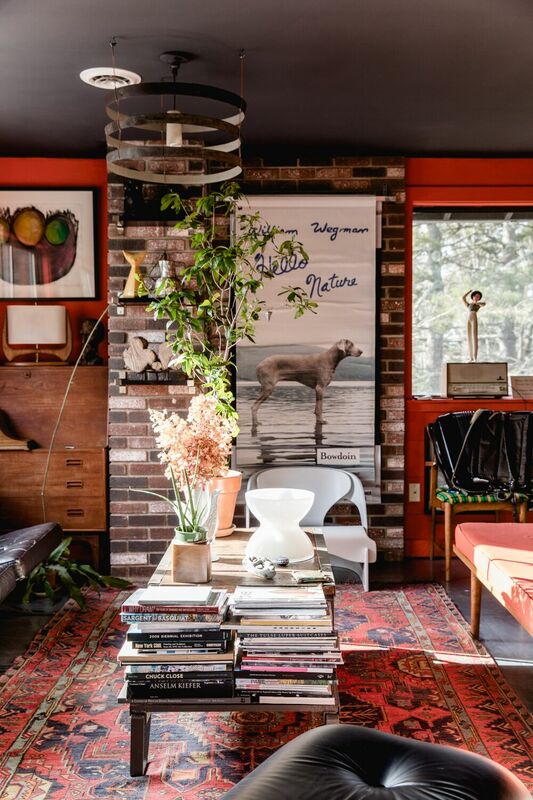 The interior is curated like a mix between a fun house and an art gallery. Always paying attention to budget, detail, humor, and style—Dan creates both artwork and intentional living space. His inventive and resourceful ways have remained constant throughout both, as well. 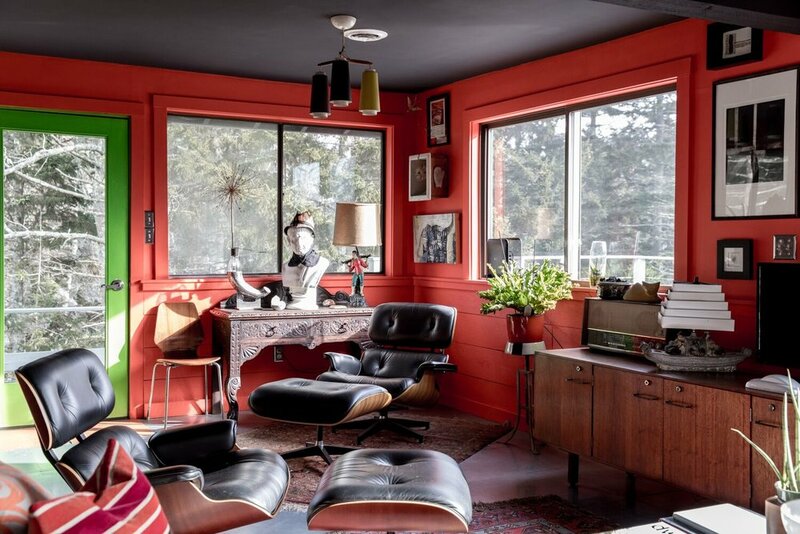 Dan shares with us how he approaches home improvement on a budget, art collecting, not being afraid of bold colors, his background in art, and his connection to Maine. unique objects, beautiful materials and color." THE MAINERS: Where were you born and how did you end up in Maine? DAN: I was raised in Upton, MA— a small town west of Boston. My family started vacationing on the Maine coast when I was a child. I developed a love of Maine through these vacations with my family. Also, my high school art teacher, who summered on Deer Isle and Little Deer Isle, would bring back objects from Maine to use in still-lifes in the classroom. These objects always had this patina and story to them, like using an old door as a backdrop. 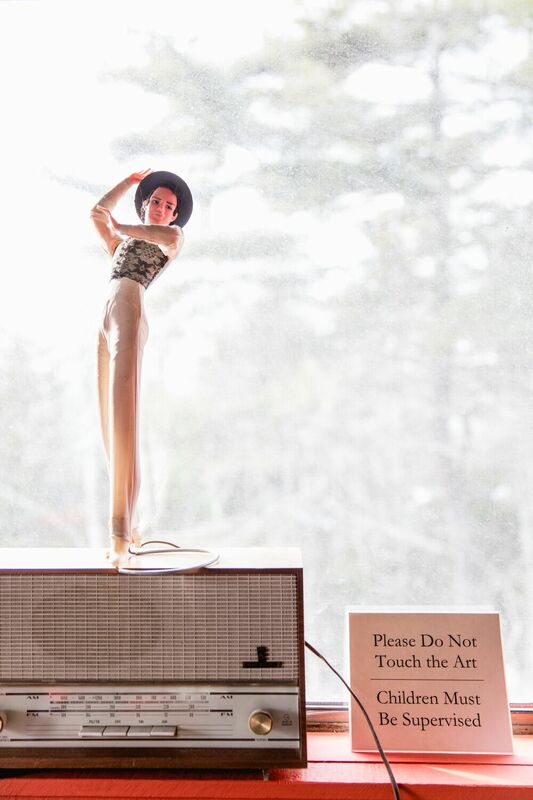 Her love of Maine through these objects made me think about it as a place to live. After college when I was working in Massachusetts, I would come to Maine on weekends and for summer vacations. I moved to Maine in 2001 to focus on my artwork and to simplify my life. I moved to my house in Phippsburg, not far from Popham Beach. I am an active board member of the Phippsburg land trust. I love my town and the neighborhood I am part of. THE MAINERS: Stepping inside your house is like stepping into a curated gallery of art and home furnishings. You clearly have an amazing sense of design and style. Can you tell us more about how you approach interior design in your living space? DAN: Thank you. I love original art, unique objects, beautiful materials and color. I like to surround myself with things that I love and love to look at. I do think about creating related spaces and how room colors will work with other room colors. I enjoy combining beautiful things from different design periods. My kitchen table is a solid walnut 19th century drop-leaf, it is next to a mahogany Empire buffet (the first piece of furniture I purchased for $50 in 1986) that holds found rusted automobile springs, Italian maiolica, my grandparents gingerbread kitchen clock, and tropical house plants. A large 20th century landscape made by a friend is on the opposite wall. Hanging overhead is a white spun aluminum mid-century light fixture. The vintage mid-century Thonet kitchen chairs were given to me by a friend. I repainted one glossy black and the other three a bright orange/red. Multi-colored circular "granny cushions" sit on the seats. THE MAINERS: The colors! Tell us more about your bold use of colors. So often you see homes stripped of any colors at all and just painted white. 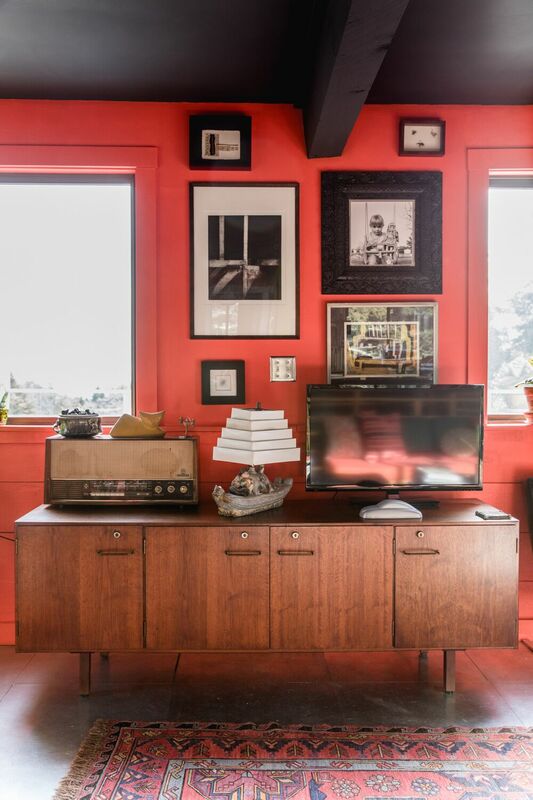 You seem to embrace color and use it as a way to enhance what you fill your space with. How do you settle on a color? 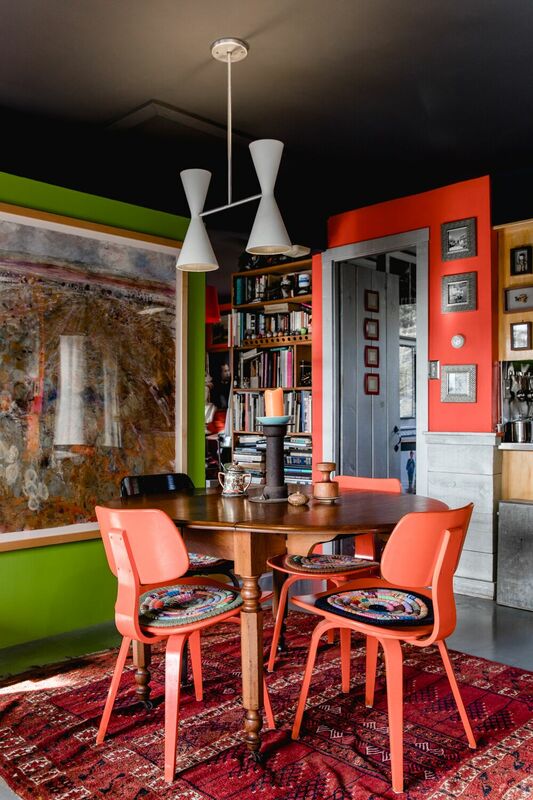 How does living in a house full of colors make you feel on a daily basis? DAN: I choose colors like I choose the items I put on my walls and in my house. I have to love the color. It is important to me that I love the color from the inside and from the outside. I often paint a wall, turn on all the lights and go outside of the house at night to make sure I like it from outside as well. Sometimes it will be simply a color I love and sometimes it may be a color that then highlights and connects with something that I have determined will be in that space. THE MAINERS: So, clearly the interior of your home is amazing and you’ve done a marvelous job with it, but there’s also a story about the home itself and how you acquired it and what you’ve done to improve it. Can you share with us the journey of your home renovations? DAN: I purchased the house 16 years ago. It was used for many years as a seasonal house and was in poor condition. Friends reminded me of the "3 L’s”: Location, Location, Location, when I was deciding to buy it. I wanted to be near the ocean and have a view and I wanted privacy. Because the house is built high on a ledge it offers privacy from the roads below. My house is on a dead-end road and is only a few minutes drive from Popham Beach, Morse Mountain, and Hermit Island and Phippsburg offers many hiking and outdoor activities. I never prepare a budget, but due to income restraints I have to be very frugal with just about everything I do. I chose to put down 26 gauge galvanized steel sheets (24-inch square in the kitchen/dining and living rooms; 12-inch in the entry foyer) as an inexpensive yet durable and unique thin flooring. It also reflects light well into the house to increase solar gain in winter months. I don’t believe in renovating to renovate. I believe in using things until they are no longer repairable. I still use the old electric stove that was in the kitchen when I purchased the house. It works well, and to make it more attractive I painted the oven drawer to match the orange/red kitchen chairs and painted the faux wood oven door handle silver. THE MAINERS: Aside from your amazing design sense, you are also a gifted artist. Tell us about your artistic journey? Have you always been creative from a young age? How did you come to make art out of found objects? DAN: Thank you again. I was told many times by my grandmother that my hands were always busy making things when I was young. I have many memories of drawing at a young age and enjoying elementary school art classes very much. I had a great high school art teacher and very strong fine art and art history professors in college. I think part of my found object interest began as a child— I grew up in a 100-year-old house that had a cellar full of metal shelves holding rusty tools, old paint cans, buckets of nails and other things I found interesting. I discovered old household dumps in my yard and in the woods. Digging for a “treasure” (e.g. a complete old glass bottle or old pottery shard) shaped how I look at the landscape. My father would take me and my brother and sister to the town dump each Saturday morning and we would poke around the metal pile and huge ash pile where trash was burned. I would sometimes find and bring home a hub cap, glass bottle, or some other fragment that I found interesting. THE MAINERS: You are the master of thrifting, dumpster diving (or okay, just visiting the local dump! ), and finding incredible treasures for your art assembly and your space. Can you give us some tips? Also, what are some of your most amazing finds? DAN: I love the hunt, I am particular, I love a bargain (free is even better), and I love to rescue something that someone else has discarded. Tips...ha! I would say don't be afraid to look and look some more. If you see something that appeals to you, consider using it as something it wasn’t meant for. Display it. I think it's easy to buy things that will make your place look cool but bringing something into your house that you had some hand in creating will be more meaningful and interesting to you and for you to talk about. One of the most amazing things I found was a 19th century parlor stove that was covered with majolica tiles made by one of the best tile makers of the time that was based in Massachusetts. I found some very early mantels and moldings that my partner and I incorporated into a summer room and some of the pieces were used in my assemblage art. THE MAINERS: Orange! It’s everywhere… you love it. Why? DAN: I do love orange. I'm not sure why exactly. I think in a way I find the color funny because we sometimes associate it with an emergency. It's a warm color that I like to use as a room color specifically because of how great it looks lit up at night. THE MAINERS: And SAABs… you are the SAAB guy. Where did this obsession come from? How many SAABs have you owned in your life? And one of your SAABs is part of a project you’re working on, so definitely tell us more about that! DAN: I think I'm a SAAB guy because my grandfather was a Volvo guy. He would take my brother and I to look at SAABs in the 1970's and I always liked their design. When I started driving, I was interested in their safety, quality, and front-wheel drive. I am always surprised by how much cargo I can fit into the hatchbacks with the rear seats folded down. They are also quirky— the ignition is found between the 2 front seats and the dashboards resemble the cockpit of an airplane (a direct influence of the jets that parent company SAAB built for Sweden). The windshields also have a significant bend. I have had 11 SAABS; old body-style 900s are my favorite. I drove my 1991 SAAB 900s to 307,000 miles. I acquired my 1988 SAAB 900 turbo from friends. It needed some love but had life left in it at 176,000. I painted the alloy wheels orange, had orange racing stripes painted on it, and made colorful interior modifications to it. This car became Projekt 900, a photo series and installation I created for the Ogunquit Museum of American Art to bring attention to the FDA ban of gay men from donating blood at American Blood Banks. I drove the car to 276,000 miles but the Maine winters caught up with it and it had to be taken off the road for rust issues. I continue to take pictures of people with the SAAB as a record of the numbers of people it has touched. "I think I'm a SAAB guy because my grandfather was a Volvo guy. He would take my brother and I to look at SAABs in the 1970's and I always liked their design." 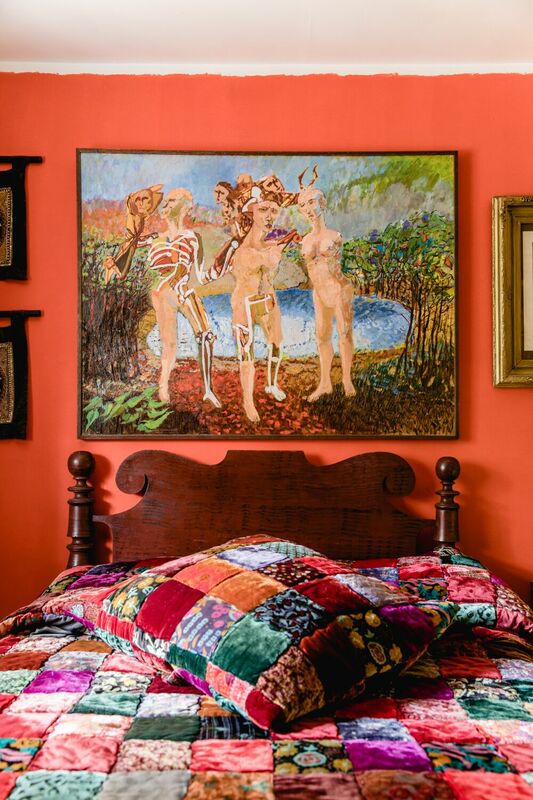 THE MAINERS: The art in your home is enviable. How did you start collecting? Do you have any tips for the rest of us? DAN: I firmly believe we should put things on our walls that we love. I think having original art acquired from someone we know adds another level to the enjoyment of the piece. I started collecting art as an undergrad— my 2-dimensional design professor had a studio sale in the South End of Boston and was selling many beautiful paintings for very reasonable prices to help fund her transition to Vermont. I purchased a small oil-on-silk that I loved and still love. I have bartered many times with artists whose art I love and respect and this has allowed me to obtain many of the works I have. I have also found a few original paintings at flea markets for reasonable prices and I picked up some antique oils at an estate auction I used to frequent in Massachusetts. THE MAINERS: You have an entire closet of jackets. In fact, the first time I met you, you were ripping apart one of your long time favorites to use for your artwork. Tell us more about your closet of just jackets. Do you have a favorite? How did you acquire most of them? DAN: I have a little obsession with vintage wool coats and vintage suede jackets. I'm not sure why. The ones I have and wear are very well made of materials and patterns I really admire and am inspired by. There is one red and black plaid wool coat that has a beautiful camel colored velvet-like lining. It's very heavy so I only wear it in very cold temperatures. If a coat or jacket has a beautiful label inside it is likely I'll be more interested in it. Some have names of previous owners written inside. Most of them are from thrift stores, but one used to be my father’s. It's dark green corduroy with a soft plush light lemon-yellow and grey-green lining.